No, we are not! 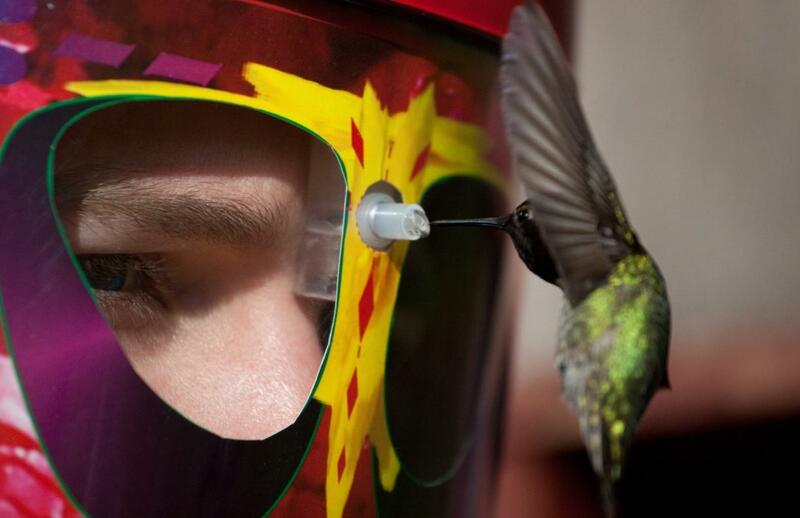 -- we have indeed invented a Wearable Hummingbird Feeder! 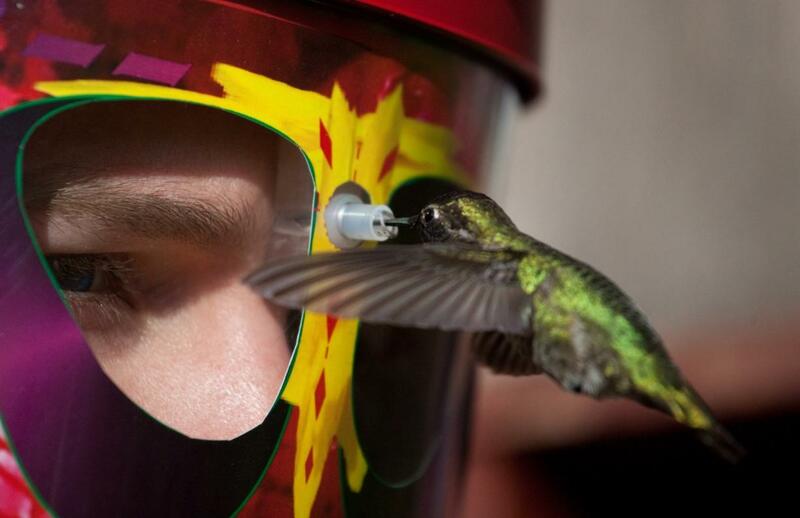 It is based on a Full-Face Face Shield with a miniaturized hummingbird feeding tube built into it on the inside. 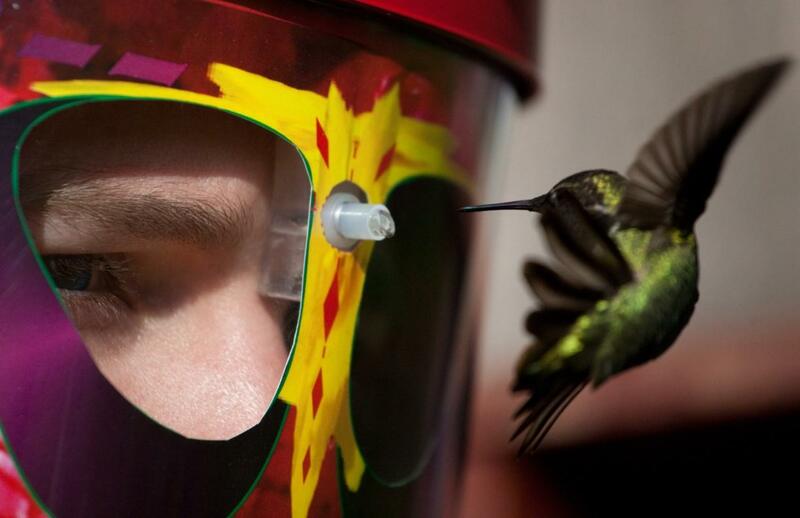 Hummingbirds feed right in front of your eyes, right between your eyes, about an inch above your nose. We have several movies for you to watch, and lots of great photos, and will get some more new shots up later this Spring/Summer. Our unique feeder is receiving a lot of attention this year and we are a bit overwhelmed with orders. Shipping is FREE (North American Continent . . . that includes Canada and Alaska!). Chris Makes a New Friend! Chris is a college student in Montana. an experience he will never forget. Here is a YouTube comment: "My gawd!!! So so so pretty! Great invention, you took the interaction to a new level, that is so priceless!" Once Upon A Time There Was A Hummingbird! 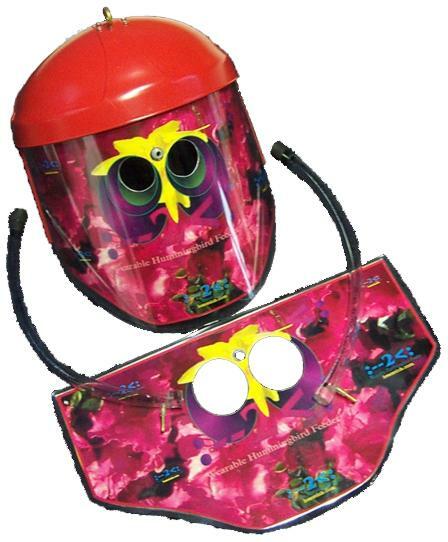 The feeder is based on a Professional Grade Fully Adjustable Full Face Face Shield. These cost $20, are built incredibly well (in AMERICA!) 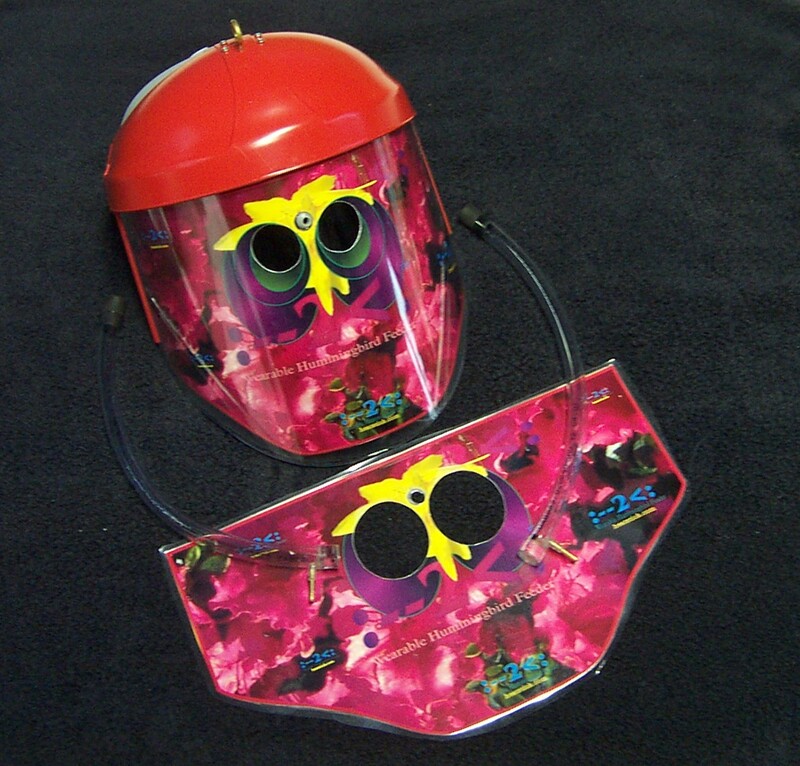 with an excellent Hi-Impact Polycarbonate and very clear face shield; but they only come in blue. We put several coats of Pepper Red Krylon on the head piece after we drill some holes for attaching the upper holder for the miniaturized feeding tube (and mask off the interior). "Figuring out" how to actually make a miniaturized feeding tube work was the real challenge in this project. The feeding tubes are individually crafted from thick wall vinyl tubing with stoppers for both ends. The smaller stopper is solid brass and allows the feeding station to pass through the support/holder in the face shield. There is a keeper hole in the side of the head piece to place the sbrass topper after it is removed so it is not lost. Two feeding tubes are included with each feeder along with a cleaning tool to clean the interior of the tube. We have created a large graphic inlay based on red rhododendrons to further attract hummingbirds to the station. There are eyeholes in the inlay that allow the viewer to watch the hummers. The inlays are laminated on both sides. Once the hummingbirds become accustomed to the feeder it may be possible to completely dispense with the inlay. We haven't tried that yet, but certainly will in the Spring. Two inlays are included with each feeder and we provide a full size downloadable file here on the website so you can make some more as you need them. We have a feeder that has been in use and kept outside for almost 7 months and the inlay is just fine. The inlays are printed on 11 x 17 inch paper and then laminated. Using and enjoying the feeder is a two step process. The first is to acquaint the hummingbirds with the feeder. We set an old can of paint on a small shelf on the side of the barn and slipped the feeder onto the can. It wasn't long before the hummingbirds found it, and after a little searching, found the feeding station. (See the Longer Video, "Once Upon a Time There Was a Hummingbird" for how this happened.) Then we let them get familiar with the feeder for a few days. Finally we set a chair next to the shelf, removed the feeder from the can, slipped it on and waited. One never forgets the first time a hummingbird suddenly arrives at the feeder right in front of your eyes. It is truly an awesome experience! (Definite adrenaline rush!) There you are, just sitting there, when WHOOSH a hummingbird jumps into your vision as if by magic! Absolutely a treat. The first few times we used an old sheet to cover up with, but quickly found out that it did not matter. The only important thing was to sit still and be patient. At the height of the season we had quite a few hummingbirds visiting the feeder and would usually have a visitor every 3 to 7 minutes. The females tended to feed longer, sometimes as long as 30 seconds, while the males where much quicker about it (5-15 seconds). It is the only feeder we have out. 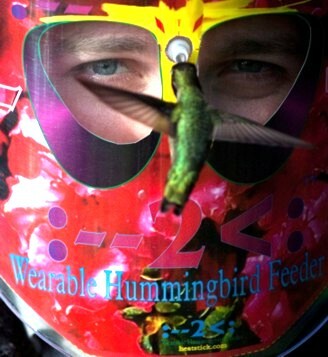 The Wearable Hummingbird Feeder is $79.95, and shipping is free to the North American Continent. 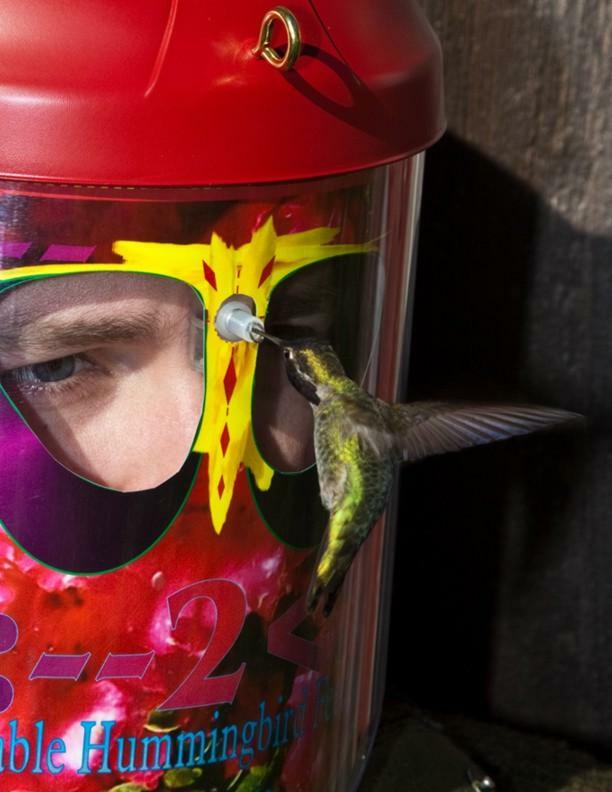 If you are serious about hummingbirds this feeder will take your relationship with your hummingbirds to a whole new level. Individual characteristics become very noticeable when you can inspect the hummers at this very intimate close distance. They "sound" different, they feed differently, they "arrive" at the station differently. This feeder is an excellent gift for a hummingbird loving friend. You can be sure of one thing, . . . they haven't got one . . . yet! Click here for our shopping cart portal. And Now for some Photos from this year (2010) . . .
And a couple of downloadable WMV movies . . .
Two Minutes of Hummingbirds feeding, inside and outside, nice shots. George G's first time wearing the feeder. You can click to watch, or download and save to show friends later. Each movie is about 2 minutes.